Ephemera In Search of Wings! or you will be given wings. This is not the first or last time I come back to this little poem. I found it on a card I’d received from a good Sangha friend congratulating me on my 25th Ordination Anniversary. That’s been stored with other cards for eight years! To keep or to recycle, that’s the question.There are sentimental attachments to detach from before cards and other materials can find their right place. Keeping is an option. These past couple of days I’ve been going through files stored in an attic at Throssel. Time to rationalize, recycle, let go of and generally make way for the new. There will be earth to stand on when I’m done or….there will be wings to carry me onwards! Saying goodbye to those physical reminders of the past can leave one a bit light-headed. So much paper! SO much of it and what a weight to shift too. Around 1998 I was given my first laptop and started using email. The papers I’ve been looking at reflect our orders gradual conversion to digital means. Up to around 2000 bulk mailings went out by post and what a protracted business that was. Letters went by post too. There are box files full of carefully filed correspondence and the like. But now and since about 2002/3 there’s no evidence of filing activity. Digital filing just didn’t have the same attraction and am slightly ashamed to say I dropped doing it. Everything I do is via email, more or less, and that’s infinitely searchable. My quandary is around the wisdom or not of recycling the great weight of paper from the past. I’m a bit of an archivist by nature when it comes to photographs and papers. Here though is a case of needing to be single-minded yet practical. So. Time to fix wings to the boxes of *ephemera and carry them to a next good use. Just as our invisible wings carry us onwards each day. We just have to acknowledge our potential to be light. *The word derives from the Greek, meaning things lasting no more than a day. How do we let life, with all of its disappointments and sorrows soften our heart? In the Tibetan tradition there is a story about the great cave-dwelling yogi Milarepa that illuminates the often bumpy road we travel in the process of releasing resistance and making peace with ourselves. From an article in Tricycle titled, Into the Demon’s Mouth. While in The Netherlands I was passed the link to this article by somebody who derived much benefit from the teaching of how Milarepa dealt with ‘demons’ he encountered in his cave. Which were of course aspects of himself turning up (so to speak) to help him go deeper. Later in the article we find this section copied below which I can certainly bow to in recognition. We have many ways of distracting ourselves so that we don’t feel the full impact of pain. Instead of being accepted into consciousness, the feeling goes underground and enters the cells of our body. It doesn’t go away; it goes in. Anyone who has had deep body work, has done intensive meditation practice, or has engaged in somatic practices on their own has likely experienced how the body reveals our history in surprising—and sometimes unsettling— ways. Things we’ve long forgotten, our body remembers with impeccable accuracy. We may imagine that spiritual awakening is something separate from our physical embodiment, but awakening and embodiment go together. To be embodied isn’t just about feeling comfortable in our own skin—it’s about a complete opening to life. Thanks to the woman who sent me the link to this article. Merit goes to your extended family at this time. For those who appreciate black and white documentary photographs here are images of some who survived the Dust Bowl disaster taken around the time of the great depression in Oklahoma and surrounding states. Most of the photographs were never published by Life Magazine. One can only imagine the determination and privations of those who stayed on their land rather than head out to the West Coast as many did, looking for a better life. I was writing to somebody this morning, seems like three days ago now, mentioning his parents who are getting up there in age. One already 90 and the other close behind. In my mind’s eye I picture their faces and their hands, testament to time. We could do with more pictures of faces that map years of life and hands that have lifted and carried.There is something about the photographs of the families caught in the devastated conditions of rural life in the mid west in the 1930/40’s which prompts a response of awe, almost. 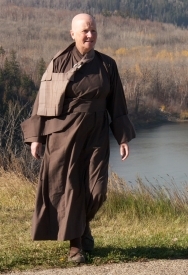 I see grit, true grit, in the faces and hands of many sangha friends I know. They are to be admired and hopefully appreciated. There is a depth of wisdom born of years. Many thanks to Michael in Canada for sending me the link to the photographs more than a month ago now. 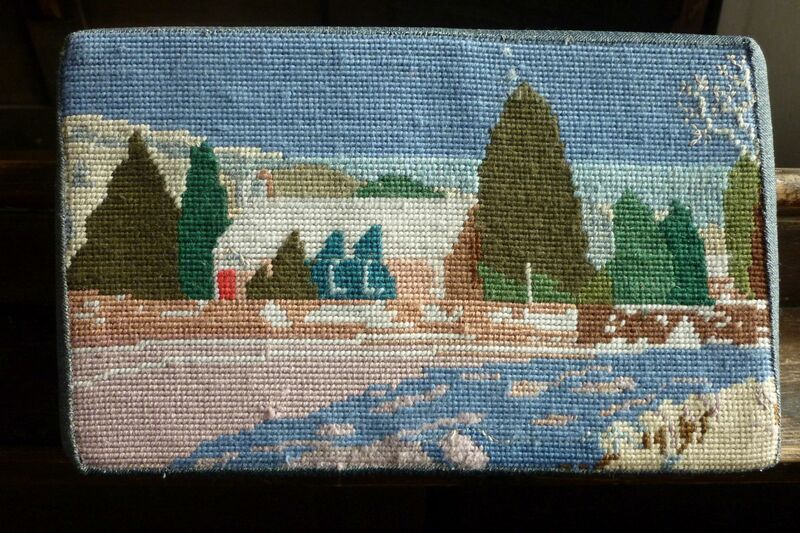 Hassock. River Eden in foreground. River Derwent below Chatsworth House Derbyshire. 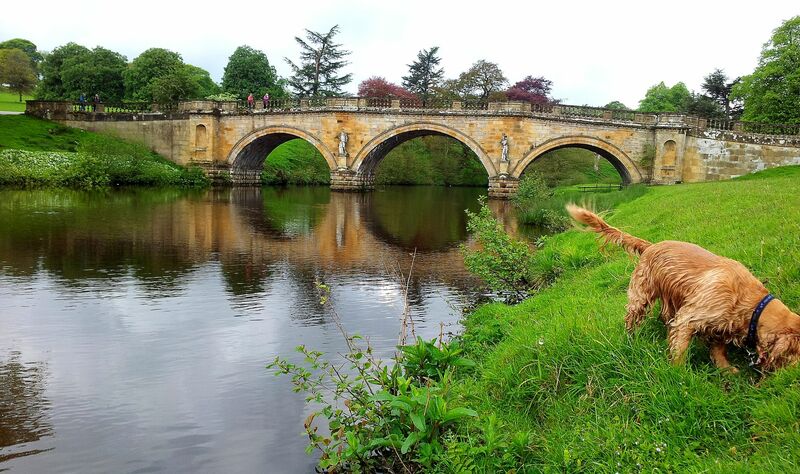 A slow flowing river runs through the grounds of the (very) stately home in Derbyshire called Chatsworth House. We just went for a walk with Kipling the spaniel beside and in the river Derwent! 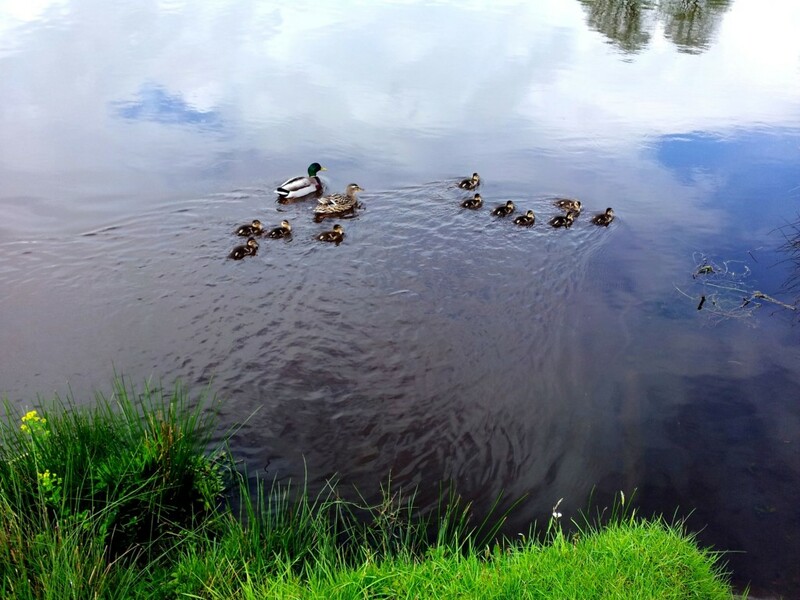 Ahhh, baby ducklings and so many of them in this family. 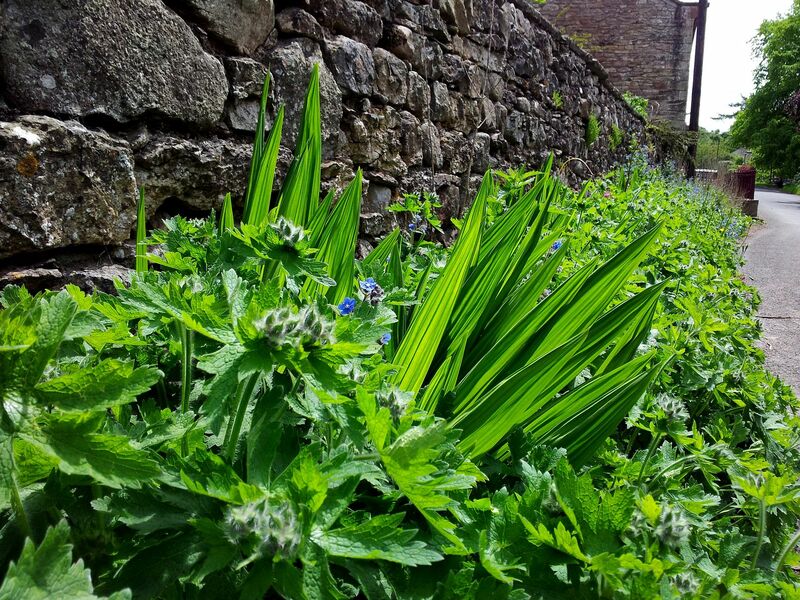 Wildflowers are in abundance this year. Or perhaps it is that I’ve been more aware of them because of walking with people who know their names. Not sure why it adds to a walk to be able to spot and name however it does for me at least. This Sunday a group of us walked along the Tees between Low and High Force in Teesdale. 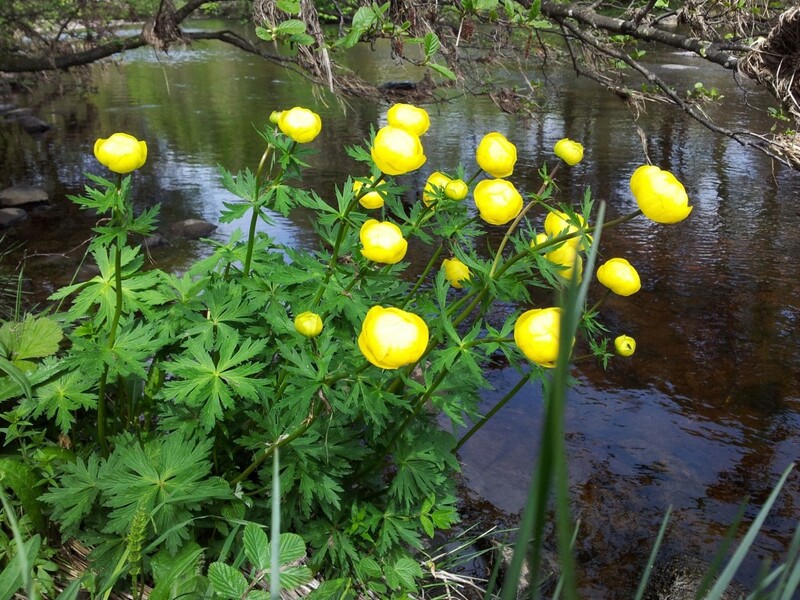 These yellow flowers, the Globe Flower growing close to the river were spectacular. Another name to remember, forget, look up and remember…. Muddy Tracks blog (where I found the name for those yellow beauties) is fantastic. Beautiful photography, humour, dogs, chicken and horses. And a record of a walk in Teesdale. But it has been a struggle this evening to do this post. Having heard news of a death this morning I’ve found myself feeling and being oddly insubstantial. Hard to put into words, I just know I need to take care while driving and not be overly worried about being a tad clumsy, tripping and bumping into furniture. A thought for the chap who died and for his wife too.